It took about 3 hours to complete the task. 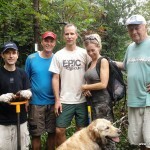 The volunteers met at the Forestream Trail parking lot shortly after 2 pm and hiked the tools down to the site of IS028. 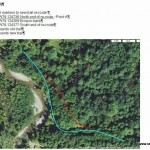 The task was to bench cut a new 30 meter section of the trail and close the existing trail. 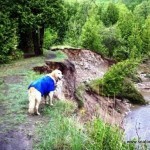 The existing trail was being undercut by the creek by natural erosion forces. The new section cuts though a cedar clump of trees on a small hillside. 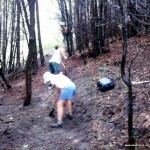 The main activity required a bench cut on the slope ground to provide a trail thread. Digging in roots is always hard work. 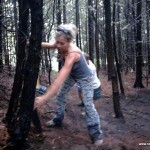 Second part of the activity required the closing of the existing trail and Monika completed most of this work. 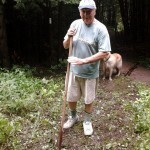 The trail markers are in place and the section is ready for use.